Diana West is a best selling author and nationally syndicated columnist. I first became aware of her with her "The Death of the Grown-Up," which examined American culture in an age of infantilism. Her most recent book is "American Betrayal: The Secret Assault On Our Nation's Character." It generated a firestorm of controversy on the right and, eventually, throughout the political spectrum for its well researched but unwelcome conclusions that America had been infiltrated to a far greater degree by agents of the USSR than previously known or publicly admitted. It can be purchased by clicking here. "Part real-life thriller, part national tragedy, American Betrayal lights up the massive, Moscow-directed penetration of America’s most hallowed halls of power, revealing not just the familiar struggle between Communism and the Free World, but the hidden war between those wishing to conceal the truth and those trying to expose the increasingly official web of lies. American Betrayal is America’s lost history, a chronicle that pits Franklin Delano Roosevelt, Harry Truman, Dwight David Eisenhower, and other American icons who shielded overlapping Communist conspiracies against the investigators, politicians, defectors, and others (including Senator Joseph McCarthy) who tried to tell the American people the truth. American Betrayal shatters the approved histories of an era that begins with FDR’s first inauguration, when “happy days” are supposed to be here again, and ends when we “win” the Cold War. It is here, amid the rubble, where Diana West focuses on the World War II—Cold War deal with the devil in which America surrendered her principles in exchange for a series of Big Lies whose preservation soon became the basis of our leaders’ own self-preservation. It was this moral surrender to deception and self-deception, West argues, that sent us down the long road to moral relativism, “political correctness,” and other cultural ills that have left us unable to ask the hard questions: Does our silence on the crimes of Communism explain our silence on the totalitarianism of Islam? Is Uncle Sam once again betraying America? 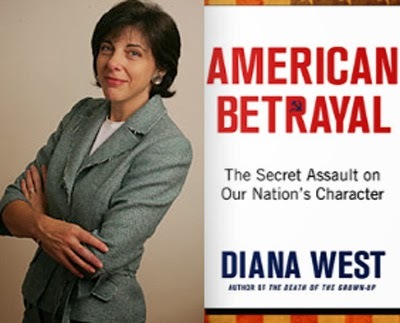 In American Betrayal, Diana West shakes the historical record to bring down a new understanding of our past, our present, and how we have become a nation unable to know truth from lies." Front Page magazine, produced by the well known David Horowitz, at first gave the book a glowing review, only to have it taken down and replaced by an astonishing hatchet job on both the book and its author. Not unexpectedly this created a firestorm. Horowitz went on record saying "She should not have written this book,'' an astonishing thing for a conservative to say who pretends to deep intellectual engagement. West responded fearlessly and thoroughly. Her response can be read by clicking here. "Diana West masterfully reminds us of what history is for: to suggest action for the present. She paints for us the broad picture of our own long record of failing to recognize bullies and villains. She shows how American denial today reflects a pattern that held strongly in the period of the Soviet Union. She is the Michelangelo of Denial." Diana West is the exclusive guest for the full hour of Gilmore & Glahn radio, Sunday, March 2, 2014 at 4 p.m. CDT. Please go here to listen in real time. The podcast will be linked to below once the show has aired. Thank you for this powerful, insightful interview! American Betrayal is the break-through book that enables an understanding of current events in context. Without it, the perspectives are missing, or are partial, and opinions/understandings/judgments are forlornly severed from realities.